Golf course living in Florida. 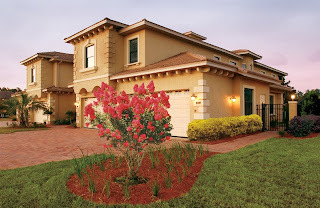 Live at a resort year-round - beautiful courses, amazing homes and outstanding amenities in Sunny Florida. The news and economic reports would leave you to believe that new home construction is at a standstill, but this is not the case at the Northeast Florida golf community World Golf Village. The master-planned development features a myriad of different neighborhoods all offering different home builders, different products and different price points. Well, one of the luxury custom home builders at World Golf Village, Legacy Builders, has decided to undertake a new project with construction expected to begin in January 2010 and anticipated to be complete by the year's end. The new project consists of five multi-unit buildings in the Laterra Links neighborhood at WGV. Each building will feature four coach homes, for a total of 20 new St. Augustine golf homes.The coach homes range from 2,160 to 2,780 square feet and include features like two car garages and screened lanais. Home shoppers can find luxury at Laterra Links as high-end finishes like granite countertops, stainless steel appliances, hardwood floors and others are offered on all homes. And while residents at Laterra Links can enjoy the abundance of amenities World Golf Village has to offer, the neighborhood also has its own list of amenities just for Laterra Links residents - a sparkling pool and a 7,200 square foot amenity center with fitness center, event room, kitchen, veranda and more. Be sure to drop by WGV for more information about these new homes in St. Augustine.